Mounting evidence suggests that human contact with nature helps reduce stress and alleviate anxiety and depression. Exposure to the natural environment helps humans cope with, and recover from, stress, illness and injury. Contact with nature also contributes to a more positive individual outlook and greater life satisfaction. The Green Referrals program originally developed in partnership with Barwon Medicare Local (now PHN for Western Victoria) as program coordinator and Leisure Networks and the local activity provider. The program was constructed as a series of eight-week activity programs in local parks for people needing to make healthy lifestyle changes. Appropriately accredited fitness providers from Leisure Networks were engaged to provide support and advice to assist participants to ‘transition’ into regular, local outdoor activity. Participants were identified by their health care providers as being pre-diabetic, diabetic or suffering from chronic, preventable illness. 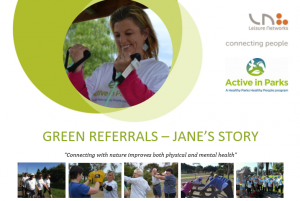 In 2010, following the International Healthy Parks Healthy People Congress, a twelve-month pilot of the Green Referrals program was developed, within the broader context of the Active in Parks Program in collaboration with Medibank Community Fund and Parks Victoria. Initially, GP surgeries in four areas within greater Geelong in Victoria were approached and agreed to participate: Bannockburn, Corio, Portarlington and Drysdale. Leisure Networks, a local community organisation, planned, scoped and conducted the initial eight-week program. The aim was to generate 100 referrals for the trial across the four regions. Qualified Leisure Networks personnel delivered the program and then provided links wherever possible between patients and community organisations, to encourage ongoing participation. Leisure Networks provided a program coordinator who handled all communications with the patients and health care professionals. Written confirmation was sent to the health care provider at the successful conclusion of a patient’s program, along with progress and attendance reports. Leisure Networks also provided statistics for a summary evaluation of the trial. Following the success of the trial, Medibank Community Fund committed to funding the Active in Parks program for an additional two years. At this stage Barwon Medicare Local was engaged as the local health agency to manage the Active in Parks program and continued the development of the Green Referrals program. Realising that certain aspects of the initial approach to Green Referrals in the Barwon region might not translate successfully over other regions with specific healthcare systems, and specific community needs, People and Parks Foundation approached VicHealth with a proposal to develop a revised program brief. The development of this new brief seeks to strengthen the connection between the primary health system and nature based activity to achieve health and wellbeing outcomes. The aim of the revised program is to provide a broader framework to encourage cross sector collaboration, particularly across health, fitness, environment and land management sectors. The program design will aim to improve local coordination and access to nature based activity as a valued health intervention. People and Parks Foundation are aware of the extraordinary efforts of local communities already delivering nature-based activities. This includes traditional exercise groups in parks through to activities with more of an environmental focus, such as tree planting along local trails. The local promotion and coordination of these diverse types of activities is often fragmented, creating a barrier for health professionals to refer patients as a preventative measure or treatment for a health condition. Green Referrals provides a platform to coordinate and in turn increase the collective health impact of nature based activities at the local and state level. We continue to engage with stakeholders and interested parties across our network to further refine the base model we have designed. If you would like to know more about how to get involved, from the perspective of a healthcare professional, a healthcare coordinator, an activity provider, or a participant, please contact People and Parks Foundation’s team at info@peopleandparks.org, we’d love to hear from you! We are extremely grateful to VicHealth, Parks Victoria, and our entire network of collaborators for their continue support towards the development of the viable, flexible and ultimately, sustainable Green Referrals program as we work towards the goal of a healthier, happier, and more nature-connected population. Click below to download a PDF of Jane’s Story – Jane was involved in the original program in Barwon. Please note that this program is no longer running, and we are in the process of refining the development of an updated program more in line with the current healthcare landscape. Katherine Baicker, David Cutler and Zirui Song write that, as well as the health benefits to employees, businesses that adopt wellness programs could save themselves significant amounts in medical costs as well as reducing absenteeism.